We investigate cardinality constraints of the form M ↪θ K, where M is a set and θ is one of the comparison operators “=”, “≤”, or “≥”; such a constraint states that “exactly”, “at most”, or “at least”, respectively, K elements out of the set M have to be chosen. 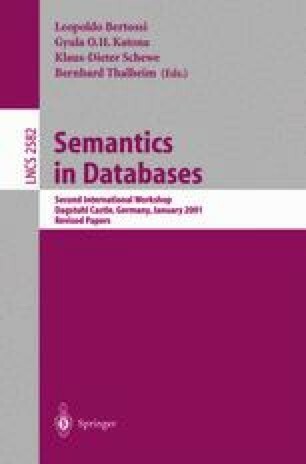 We show how a set C of constraints can be represented by means of a positive-disjunctive deductive database P C , such that the models of P C correspond to the solutions of C. This allows for embedding cardinality constraints into applications dealing with incomplete knowledge. We also present a sound calculus represented by a definite logic program P cc , which allows for directly reasoning with sets of exactly-cardinality constraints (i.e., where θ is “=”). Reasoning with P cc is very efficient, and it can be used for performance reasons before P C is evaluated. For obtaining completeness, however, P C is necessary, since we show the theoretical result that a sound and complete calculus for exactly- cardinality constraints does not exist. D. Seipel: DisLog-A Disjunctive Deductive Database Prototype, Proc. 12th Workshop on Logic Programming (WLP’97), 1997, pages 136–143. DisLog is available at http://www-info1.informatik.uni-wuerzburg.de/databases/DisLog.